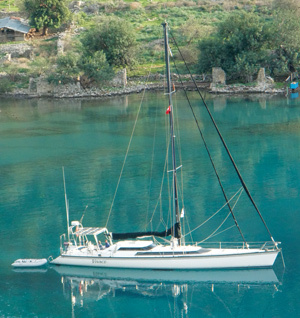 Budget Sailing Turkey offers a completely new programme with her latest purchase, the MacGregor 65 “Vivace”. The MacGregor 65 is designed for worldwide cruising and chartering and is one of the few production yachts eligible for the American Bureau of Shipping’s +A1 rating and for Coast Guard certification. It is also one of the fastest production cruising sailboats built and is a welcomed change to the usual heavy displacement boats on the charter market. Water tank 225 gals/ 852 lt. Waste water tank 100 lt.
With Vivace’s high speed, under power or sail, makes it possible to cover longer distances that could not otherwise be achieved within the usual one or two week holiday period. The wind and waves of the Aegean, especially during the Meltemi, can be quite uncomfortable for most other heavy displacement boats. Due to her long waterline and lack of overhang, Vivace is barely disturbed by choppy seas. Starting from our homeport of Göcek and depending on the length of your holiday, there is a wide choice of itineraries: Cyprus, Athens, the Dodecanese (Rhodes, Symi…) and Cylades (Santorini, Mykonos…) or longer distances along the Turkish coast (Marmara, Istanbul…). For those who wish to add miles to their sailing log for training and qualification purposes, we can offer itineraries of at least 300 miles, including 2 night sails. 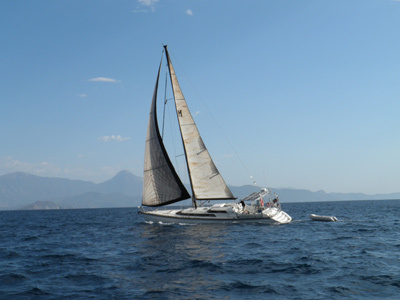 You don’t need to be an experienced sailor to be able to enjoy an amazing holiday on board “Vivace”. Just plan your own cruising route and go at your own pace. 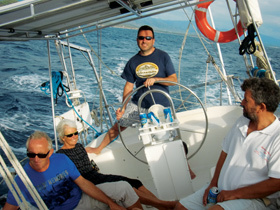 Alternatively, our skipper/instructor will be happy to advise you about a possible itinerary including distances, weather and wind conditions, and places worth visiting, etc. 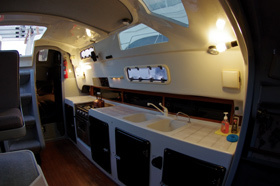 During your time on board, Vivace is your home, so you are free to use the galley and make your own meals. 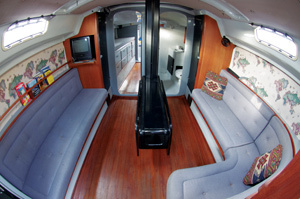 You can also decide if you want to go ashore or stay at anchorage in a quiet, scenic bay. We offer flexibility and support depending on your requirements. The MacGregor 65 is the fastest production cruising sailboat built. The narrow entry and a deep V-shaped forefoot allows her to slice through the waves. Upwind you might have a rather wet ride with a steady stream of water over the foredeck but the cockpit is aftmost so the spray rarely reaches the cockpit. Downwind she is a great sailboat, just surfing down the waves. The long length means less hobby horsing too. 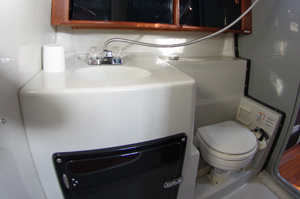 Because of the narrow hull line, you may need to reef sooner than in a beamier boat. 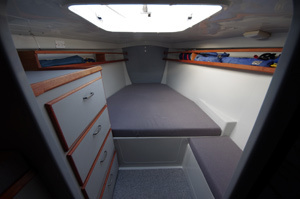 The self tacking staysail eliminates sheet tending with each tack. 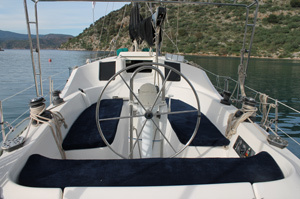 When the boat is tacked, the sail moves automatically to the opposite side of the boat without the need to release and re-tighten the jib sheet. The skipper simply turns the wheel. She also has a very balanced rudder; the steering is just over 1 turn, lock to lock, so she is very quick to react and easy to hold. All the cockpit winches and controls are near the helmsman. 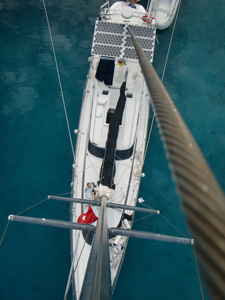 It is necessary to go to the mast for main hoisting and reefing, but all other lines are led aft. 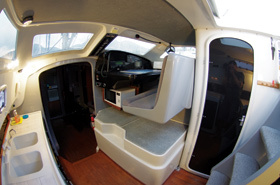 The relatively small, easily handled sailplan will drive the boat at speeds that few other cruising boats can achieve. 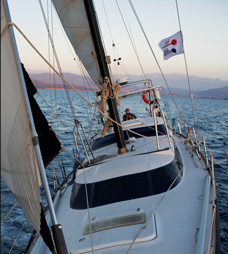 In winds of 15 knots, Vivace can sail at over 11 knots, and speeds of over 25 knots can be reached in strong winds. 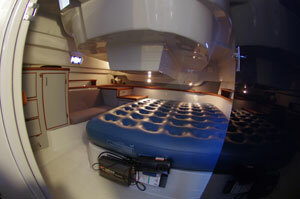 The boat can exceed 9 knots sailing to weather. Vivace has a minimalist style and has little of the typical teak trappings. 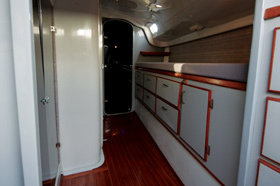 This modern approach provides very functional and elegant atmosphere below decks. 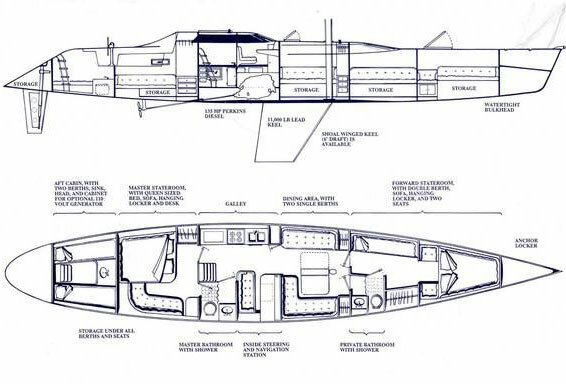 There are two cabins, a master and forward cabin, both equally large and comfortable with their own private bathrooms, a comfortable salon, a large galley and a pilot house with inside navigation and steering station. She accomodates up to 5 people.